A while ago St Ives allowed one of its historic GWR railway station lamps to be removed. 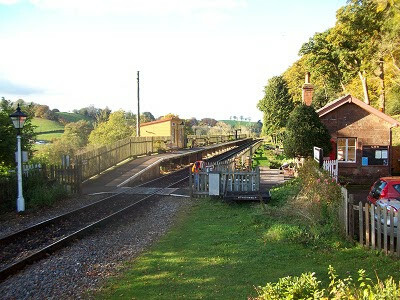 It is now fully restored and installed at Stogumber Station, near Taunton on the popular West Somerset Railway Line. To mark the unveiling of this historic piece of St Ives railway history, a coach has been reserved to travel from St Ives up to Taunton. From there a railway carriage has been reserved - exclusively for St Ives folk at no charge - to travel to Stogumber. A buffet reception has been laid on to welcome the St Ives party. After the unveiling - and brief speeches by the Mayor of St Ives and WSR Station Master - everyone is invited to join the train to Minehead and to enjoy a full round trip on the railway by steam. The trip is on Sunday 10th April. The coach will depart St Ives (Royal Square) at 8.00 am, will pick up en-route if needed, and will return around 10.00 pm. Cost is £13.00 for adults and £10.00 for children under 14. This trip is expected to be extremely popular so those wishing to travel should reserve a place as sonn as possible.